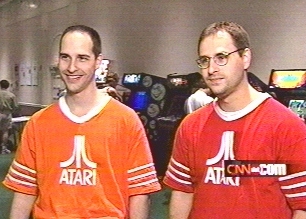 Manfred: John, the picture shows you and your brother Mike at the Classic Gaming Expo 2001 in Las Vegas, interviewed for CNN.com. Tell us something about this picture. John: My brother and I caught the eye of the CNN filming staff with our matching Atari shirts. I grew up with three brothers who were all huge classic arcade fans so it made sense to go to my first classic gaming expo with one of them. The interview was quick - I talked mostly about my passion for classic games and how today's games were just too complicated. The expo itself was fantastic; I have since been to CGE 2K2 and most recently CGE 2K3. Manfred: CHAMProgramming is out of busines since 1998. Still fan of the classic arcade games? John: Yes - I am still a huge fan of classic arcade games. I do own an XBOX and Playstation 2, but try as I might I cannot seem to get into the new games like I did with the classic games so long ago. In the winter of 2000 I was re-introduced to my first love of video games - the Atari 2600. Manfred: What inspired you to get into game programming? John: My true inspiration for getting into game programming was the Atari 2600. I was always fascinated by video games and was often asking myself "How did they do that??". In 1981 myself and a friend conceived a game for the 2600 called "Moutain Raider" and sent our design to Atari; unfortunately the idea was rejected. From there, I moved onto actual programming on the Atari 800. I started small, teaching myself BASIC and programming simple games like a slot machine simulator. My 1983 I was writing full games - still in BASIC, including a karate game and a maze game called Sorcerer similar to Wizard of Wor. I even wrote a piano simulator - my other passion - called Music Maker that allowed you to enter notes on the screen using a joystick and have a song played back. Manfred: What was your educational background to write the games? John: As I said, I was self taught for all of my BASIC programming games. In 1990 at the University of Connecticut I took a class in C and assembly that really opened my eyes to the possibility of game programming. I also learned alot of game programming ideas and tricks by reading the many books on game programming that were available at the time. Manfred: CHAMProgramming had published eight top games between 1996 and 1997, and additional some games up from 1992. Tell as something from the early games, when did you start programming CHAMP games and how many people worked for CHAMProgramming? John: In 1991 I started writing my first game on a PC using EGA graphics called Last Defense. This game can best be described as a CHAMP mode of Missile Command, with very similar gameplay and a lot of extras, including 5 different kinds of weapons and a shield that protected the cities. My next project was an EGA version of Centipede - that was never released to the public. In 1993 I was introduced to the Internet and AOL. On AOL there was a download section for shareware games, and after playing some of them I told myself "Hey, I can do this! Maybe even a little better!". That was my inspiration behind the original releases of Asteroids, Pac-man (Pacmaniac), Ms. Pac-man and Galaxian. I remember I used to log into AOL and check to see how many people had downloaded my games - it was quite a thrill! Manfred: Did any other programmers help you with the games, as far as sound or graphics? John: At the height of CHAMProgramming, we had my wife to be, my brother Paul, a graphic artist, a sound specialist and someone to process orders working for the company. I was the sole programmer on all of the games, but I left the graphics and sound effects to the professionals. Manfred: I�d like to get technical for a minute. What programming language did you use for your games? What hardware and what software was used in development? John: All of the CHAMP games were programmed in C, with the graphics engine written in 100% assembly. The original idea behind the CHAMP games was to program them so they could run on a 386 25Mhz machine using VGA graphics. The early games were programmed on a 386 40Mhz machine using Turbo C 3.0. The later games, starting from CHAMP Kong, were programmed on a Pentium 200MHz machine using Borland C++ 3.1. Manfred: How was it working in your company? Any stories from those days? John: For the most part, working for CHAMP was alot of fun. Before CHAMP Kong, there was only my wife and myself handling the company. When CHAMP Kong was released and champgames.com was set up, things really took off. At the peak of CHAMP I was working a full time job and then coming home to answer emails - about 100 a day, process orders and then find time to work on the games in development. One of the funniest stories involved CHAMP Kong. Although the sound effects and music for the later releases were done by Sound Solutions, I handled the sounds for the early games. I almost drove my wife crazy trying to perfect the music for the "How High Can You Climb" song in CK - I must have played it 1000 times in one night in our studio apartment!! That and the starting song for Ms. Pac-em almost had me living out on the street... One thing that always struck me and my wife as really funny was some of the letters and emails we would receive. Most people thought we were some huge company running out of an office building when it reality it was most just her and I and a 2nd bedroom converted into a makeshift office. I guess we did a pretty good job coming off as something bigger than we were. Manfred: What was the biggest success for your company? What was the best selling game? John: The biggest success for CHAMProgramming was the quality of all the games we released. I am very proud of all of our games and the overwhelming positive response from all of our fans certainly made it all worth while. By far, our best selling game was CHAMP Kong, which accounted for almost 40% of our sales. Right behind Kong was Ms. Pac-em. I think if Galagon had more time on the market it would have sold as good as or even better than Kong. Manfred: What are some of your favorite games, or type of games? John: Right now, my favorite type of game is the action RPG, like Balder's Gate for the XBOX. I always loved a good shooter - like Galaga - or platform game - like Kong. I had a passion for PC sports games in the early 90's - Earl Weaver Baseball comes to mind - but since everything has gone 3D they all seemed to have lost that fun factor. For me, I always want to know that I'm playing a game but the industry today seems bent on trying to convince the gamer that what they're playing is real. I guess that's one of the reasons why I started CHAMP games in the first place. Manfred: What is your line of work now? John: For the last 10 years I have had a full time job as a software engineer. Right now I'm working for a company that deals with writing software to detect credit card fraud. It's not as fun as game programming, but it pays the bills. Manfred: Can the CHAMP game lovers expect someday a new classic game, published by CHAMProgramming? John: Unfortunately, CHAMProgramming will never produce another game - at least under that company name. My life has become quite busy in the last 5 years, including a marriage, house and 2 kids. I have had a lot of people ask if I could finish up CHAMP Burger Climb and Frog-em - both titles were about 70% complete when we shut down - but right now I really don't think it will ever happen. Manfred: Final question. Why did you get out of game programming? Would you ever consider getting back into it? John: The biggest things I got out of game programming was a constant challenge, an outlet for my creativity, and the satisfaction of producing something that people got enjoyment out of. I miss these things dearly and have seriously considered getting back into game programming in one way or another. As I said above, I have a huge passion for the Atari 2600 and have actually started programming a few games for the system. The development is the most challenging task I have ever taken on, but I would like someday to produce a game for that system. One of the games, of course, is the "Mountain Raider" game that was rejected by Atari 20 years ago. Like they say, if you want something done, sometimes you have to do it yourself. Manfred: John, thank you for this interview.